Medium sized cabinet with distressed blue colouring and one internal shelf. This piece of furniture has been made and imported directly from India. This cabinet is a prime example of the colourful, different pieces we find out in Rajasthan, one of India’s most vibrant regions. 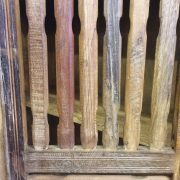 A modestly sized piece, this cabinet has been made from reclaimed wood and has been finished with a distressed wash of blue that has purple hues in places, giving it lots of character and making it stand out from the rest. The cabinet has a panelled door and sides, indicating the level craftsmanship that has gone into this simple yet durable piece. Inside the cupboard there are two levels for storage divided by one internal shelf, all finished with a dark brown finish that contrasts with the brighter external colours. The whole cabinet sits on top of four small wooden feet. Perfect as an eye-catching addition to a more quirky, colourful home. 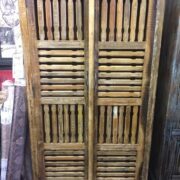 This cabinet would be perfect for a bedroom, living room or hallway. UNUSUAL INDIAN FURNITURE AND ACCESSORIES – Take a look at our blog about this style of furniture here. This item is in stock in our furniture shop in Brighton and Hove, Sussex.